101 Cookbooks is one of my favorite blogs because Heidi takes such beautiful photos of food and I love food pics. The last couple times I’ve tried something from the site it just didn’t suit my tastes (I really didn’t like the cornbread I tried for Thanksgiving). 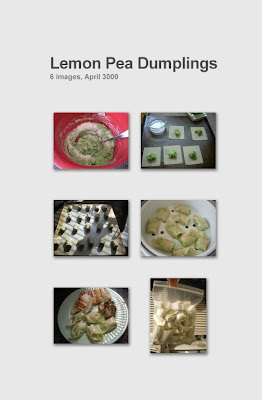 But last week I made a batch of what she called plump pea dumplings but the strong lemon flavor makes me want to add that to the title of the recipe. I think I stuch pretty close to the recipe (somewhat amazing for me). Although my hate for shallots had me subsitute them for a combo of garlic, scallions and a bit of onion salt. But I really loved them last week and today as I pulled a bunch from the freezer. I’ve pan fried them, steamed them and boiled them. I think I like them boiled best (well as long as they don’t fall apart). If you’re interested in making your own check our the recipe here.